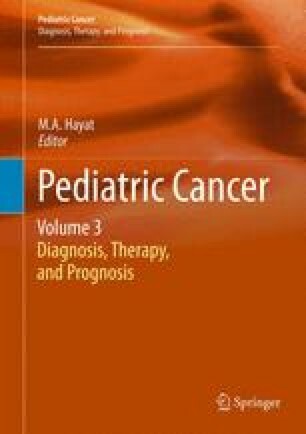 The highly malignant rhabdoid tumours (MRTs) in particular atypical teratoid/rhabdoid tumours (AT/RT) are generally considered to be a childhood tumour with the majority of patients presenting at younger than 5 years of age. In most cases these tumours arise from inactivation of the INI1/SMARCB1 gene due to 22q11.2 deletions. Germline alterations of INI1/SMARCB1 have been found in up to 35% of patients with rhabdoid tumours. Patients with germline alterations generally present at an earlier age and with more aggressive disease, commonly with multiple primary tumours. The chromosomal region on 22q11 is highly susceptible to microdeletions and microduplications due to the presence of several low copy repeats (LCR) within a 9 Mb region. The proximal deletion at 22q11.2 is the most well known microdeletion syndrome in this region and gives rise to DiGeorge/Velocardiofacial syndrome (DGS/VCFs). However the lesser known distal 22q11.2 deletion syndrome, when it encompasses the INI1/SMARCB1 gene, confers a high risk of developing AT/RT or MRT. Patients diagnosed with distal 22q11.2 deletion syndrome who also have rhabdoid predisposition syndrome due to loss of INI1/SMARCB1 should undergo careful monitoring due to their increased risk of developing these type of tumours. I would like to thank my friends and colleagues at Central and Southern Regional Genetic Services for their proof reading skills and Kathryn Seally for her help with Fig. 3.1.